Starting your own business can be a lot of work and figuring out what legal aspects are involved can be overwhelming. 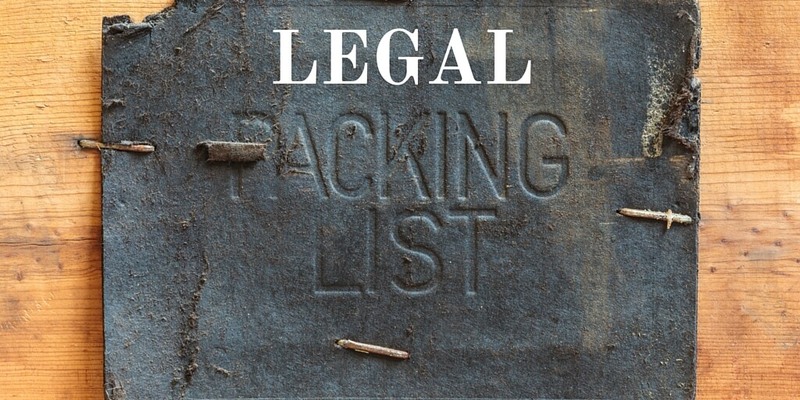 Go through the following legal checklist to make sure you do not forget anything! Obviously, picking your legal entity is part of any legal checklist. However, choosing your appropriate legal structure is not that simple and depends on many factors like: control aspects, personal liability, continuity desires, ability to raise capital, tax considerations, legal regulations, hiring plans for employees and desires to form partnerships. A written agreement between the owners like the articles of association, a shareholders agreement, a joint venture agreement or a partnership agreement. A non-disclosure agreement to protect the usage of confidential information by your employees or other parties that you do business with. Employment contacts to address the rights and obligations of both the company and its employee(s). Depending on the type of business you run, and where you are located, you may need specific business licenses and/or permits from your country, state, county or city. They come in many variations, and examples include, local business licenses, building permits, health safety related permits, permits for home-based businesses, fire permits, industry-related permits (like running a legal practice, hospitality, construction or manufacturing business). There are so many possibilities here that it does not make sense to include a thorough list of items for this category in this legal checklist. Register your company with the tax authorities at country and/or local level. File annual corporate income tax returns or include your business income in your personal income tax returns depending on your legal entity structure. Register for VAT/sales taxes and submit returns on a regular basis. When you operate an international business, you need to figure out whether you have any tax obligations in your foreign customers’ locations like filing foreign corporate income tax or VAT/sales tax related returns. When you have employees, you may need to obtain an Employer Identification Number and fulfill all types of wage withholding tax obligations. What are the implications of hiring an employee versus an independent contractor? Know your tax obligations like payroll, withholding taxes and related filing obligations. What are the implications of firing someone and related unemployment insurance? Do you know the applicable anti-discrimination laws? What are the minimum wage/hour requirements and are there any other specific industry related regulations. Depending on what type of business you have, protecting your IP or using others IP may also come into play. In general, the main property that creates value in your company is your IP. However, the legal aspects surrounding IP can become very complex, and most startups or SME’s just “intentionally” ignore most of the IP aspects related to their business because of this complexity, the lack of resources and needed investments to make. Registering your trade name, key brand & product names, and logos. Register your inventions and innovations through Patents. Create Copyrights for creative expressions and original content. Making agreements on proprietary and confidential information comprising your Trade Secrets. It’s important to realize that it is not enough to simply register or claim ownership to your IP. Generally, the owners of IP are required to monitor and proactively enforce their rights or risk losing them. Bookkeeping – In most countries, you are obliged by law to record all your business transactions and keep all underlying documents in a certain format for a minimum period of time. So it is essential to figure out your record keeping obligations and set up a proper filing and bookkeeping system for all documents and transactions. In this curated list, you can see what the best and most favorite online accounting applications are for small businesses. Chamber of Commerce – In some countries you are obliged to register your business with the Chamber of Commerce but it can also be a good starting point because generally, they have a lot of resources covering all aspects of starting a new business. Email regulations – When you send emails to your customers or when you are targeting potential customers via email campaigns you need to find out what the applicable email regulations are because each country has its own set of rules. Aspects covered by these rules generally include opt-in versus opt-out, B2B or B2C emails, unsubscribe rules and minimum information to be included in your emails. As you can see a lot of legal aspects are involved when starting or running your own business, and we only covered the most common items to think of here. Depending on your background you can do a lot of things yourself by using common sense, being practical, and putting some time and effort into further investigating the particular aspect. All sorts of local Legal Services Providers can be searched for like Boutique Law Firms, Corporate Lawyers, or Freelance Lawyers that can further help you on any legal aspect of starting or operating your own business. All sorts of tax advisors, including tax firms, tax advisors, and freelance tax advisors who are more than happy to assist you with all tax aspects of running a business. If you need specialized US tax advice, you can search for US tax services, furthermore many other tax specialists for other countries can also be found. If you need local Accounting Services, all sorts of Accounting Experts, Accounting Firms, and also Freelance Accountants can be found. Via our Legal Community Forum, Professionals and Clients can share knowledge by having Q&A conversations about typical business issues or best practices in relation to Legal. Here you can share your Legal Knowledge, rank answers by how valuable they are, or just read and follow any Legal topic you want, and get noticed when new contributions are made to discussions you follow. Via our Legal Briefing Room, the Top Legal Resources on the web are followed and only the most shared content is shown. You can filter all the content for the last 24 hours, 3 days, 1 week, 1 month, 3 months, etc so you can easily find and stay up to date with the latest Legal Developments. Want to share your favorite Legal Resources? Just complete our online survey in less than a minute, we do not ask for your email and you can skip or answer any question you like. We will include your suggestions in one of our Best Legal Resources Shortlists if we also like it. Then via Legal Knowledge Resources, you can quickly find the best Legal Resources on the web as suggested by our users and visitors via the above online survey. Think of blogs, books, learning, online courses, cheat sheets, university rankings, firm rankings, salary surveys, tools, industry reports and much more, all related to the Legal Industry. We prepare a base list of Legal Resources and then this list is continuously updated basis tips received from our users and visitors.